Politicians in Pakistan have been known for their corruption and loose morals, but no one comes even close to Abdul Qayyum Jatoi of Pakistan People’s Party, who just resigned, correction, was rather sacked, from the position of Federal Minister of Defense Production and is MP from Muzaffargarh, Punjab. He has completely different ideas altogether when it comes to politics, morality and the responsibility of public office. Surely he has revolutionized the concept of equality and equal opportunity with his brilliant ideas. He is probably the only politician, and also the only person in the world, who openly approves of corruption, calls it the right of politicians and believes that everyone should have an equal opportunity for corruption. Oh well, at least he is honest. Take a look for yourself. His recent Press Conference in Quetta eventually got him into trouble. Again he shamelessly trumpeted his just ideals of equality that everyone should have an equal right to corruption, which clearly shows that he cares for everyone. Not only that, but he also criticized the Army and the Judiciary to an extent which got the Prime Minister Yusuf Raza Gillani a bit agitated. He should have taken action when he made that irresponsible and insane remark for a figure holding a public office on that TV show, but at last, he made the right move. He maintained that he made the remark in “personal capacity”. How absurd! Mr. Jatoi, I think you are a leader (unfortunately) and when you make a remark in a public press conference, I don’t think it is considered to be a “personal remark” for which you should not be held accountable, especially when you are serving in public office. First you need some basic lessons in leadership and politics, and only then should you be allowed to run in elections. But then again, he is not the only Pakistani politician who needs such a lesson. This clearly speaks volumes about the politics in Pakistan. It does not really need a lot of elaboration. Jatoi was summoned by the Prime Minister and was asked to explain his remarks. On his failure to satisfy the Prime Minister, he was asked to step down from the position of Federal Minister for Defense Production. Mr. Gilani is one of the most generous souls in the country. Had I been the Prime Minister, not only would I have asked for his resignation from the National Assembly, which is the House of Representatives in Pakistan, but would have also recommended to the Party Leader to kick out this ridiculous criminal from the party. I think Mr. President needs to take some action as well as the Party Leader, because as far as I know, he has been silent over the matter. I don’t want to be discussing party politics here, but speaking impartially, Pakistan People’s Party, founded by a visionary like Zulfikar Ali Bhutto, needs to decide whether it is appropriate to associate themselves with people like Jatoi. Because if they don’t mind, the party will soon be recognized as a symbol of political corruption in Pakistan, if it isn’t already. At least the people of Pakistan should make up their minds clearly about it. Vote for any party you consider appropriate, but don’t vote for criminals and morally corrupt people like Abdul Qayyum Jatoi, or the country will never progress and improve from its current state of shambles. I am sorry to say this but if anyone votes for Abdul Qayyum Jatoi after all this, I will have to deduce that either that person is not sane, or is a traitor who deliberately wants to destroy Pakistan. Every Pakistani, whether they admit or not, is bonded with India, a mass of land we also refer coldly to as the sub-continent. Making that point clear, I would like to say that it is not difficult for me to understand a veiwpoint loyal to the Unity of India, to which I have no problems at all. Because after all, I am an Indian too, despite the fact that I was born in Pakistan and am a Pakistani national. But despite all that, most of all I am a human being before and more than anything else. But this is really not what I am writing about here. What I write about now concerns humanity more than country or politics, which are the least of my concerns. I want to write a few words on the violence in Jammu and Kashmir. Although I have been refraining to make any comment on the subject at all, but my conscience had the better of me, which was an indication that at least some part of it was indeed alive. I have had a few Kashmiri friends so I have some idea about the problems faced by Kashmiris and what they really want. In fact, if any one of you makes the effort, which is not hard to do, you can easily put yourself in a Kashmiri’s shoes in order to learn how they feel and what they have been going through. I understand the presence of Indian Armed Forces in Kashmir, and I also understand the difficulty of India’s position as far as the troubled State is concerned. But despite all that, I have to say that encouraging and approving of the violence and atrocities going on there out of patriotism for India is simply inhuman to me. While some people may object to this piece due to the fact that why a Pakistani is speaking out against the violence in Kashmir, I would simply like to say that I would have done the same and would have felt the same way If I were an Indian National. I would simply say that humanity should be held supreme to politics and patriotism, read armies brutally murdering defenseless citizens. But thankfully, at least the Indian media is covering the matter relatively sensibly this time around, although not to the Indian ultra-right, since some people in the media are acknowledging India’s mistakes and asking questions of how the government is handling the matters there. The educated in India are certainly offering me, if not the Kashmiris, a ray of hope towards the resolution of the problem. Amid all the nonsense and the insensitivity of brutal rightist patriots, I cannot help but admire the honesty, the daring and the outspokenness of people like Arundhati Roy, who indeed has a soul of an artist. But really while I tried hard to approve of all that violence, I figured out that I would have to cease to be a human being first in order to do so. At least she has the guts to say that Indians are not doing something right in Kashmir. I cannot help but feel sorry for the insensitivity of the patriot scholars who call her a traitor. I do not consider them educated. A loyalist to humanity is greater than a patriot to a nation. But it is nothing new. People who speak the truth have often been labeled as traitors , such as Asma Jehangir on the other side of the border. As for the Indian patriots complaining why Kashmiris want “Azadi” or “Freedom”, ask the question to Kashmiris. Had they been living in peace, would they have ever demanded it, even if the idea was injected by foreign infiltrators from Pakistan? Would have they not rejected it because thinking that way would be treason? To my mind, the Kashmiris do not care about what will happen to them as long as they can be free, even if global and neighboring regional powers make the land their battlefield, since it will be up for grabs for them. Things can hardly get any worse for them than whatever has been going on for more than two decades now. While I acknowledge and condemn the exodus of the majority of Kashmiri Pandits from the valley at the hands of the extremists there, I cannot help but notice the oppression of the majority of Kashmiri Muslims at the hands of the Indian Security Forces there as well, trying to be as impartial to both these groups as possible. Had all this been happening in Pakistan, I would have condemned it still. Had I been an Indian, my opinion would not have been any different. I condemn all such acts, whether carried out by the Indian or the Pakistani army, by the Indian or the Pakistani police or by any other authority-abusing-citizen-terrorizing-so-called-law-enforcement-authorities anywhere around the world. I condemn violence and I condemn injustice. But it is not hard for me to imagine at all, that if my family were killed by the Indian forces, and if my mother, or my sister, or wife, or daughter, or any other female friend were raped by the Indian Forces, then surely my patriotism for Indian would fade away there and then. There is just no other way to it. It is a well-known fact that among all conflict zones occupied by armed forces around the world, Indian Occupied Jammu and Kashmir has the highest count of sexual assaults made on women. I am not really a supporter of the Kashmiri Freedom movement, but if that is what the Kashmiris of both sides want to live in peace, let it be, even if that hurts the Indian and Pakistani egos. But for those who want to do so, to my mind the best way to help Kashmiris right now is to leave them on their own, so that they can find their way to freedom themselves. Freedom is never granted, but it must always be earned. I don’t want to sound audacious but Kashmiris in the Pakistani Occupied Kashmir are living much more affluently, comfortably and in peace. At least even if no real economic relief is being offered to them, they are generally living in peace, without which how can you ever have peace of mind and pursue any further socioeconomic advances? I know that because I know them and they freely live among Pakistanis as equals, not as rebels. 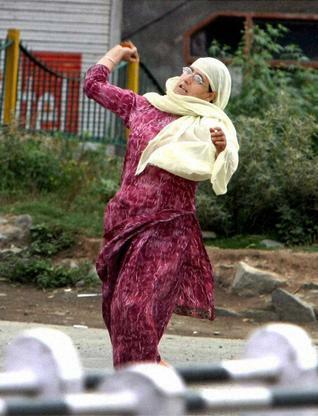 Still they ask Kashmiris why they want freedom. Pretty much like asking a dying patient why he needs a doctor. Why Peace in the Middle East is Becoming Next to Impossible? So what or who offers a hope amid the darkness? Maybe Tzipi Livni? Who knows? These 13 minutes and 6 seconds will reveal a lot more than what any comment possibly could. But you really have to Thank God that you are not a Palestinian living in the West Bank or the Gaza Strip, unless you are one. This year, 2010, we observe our Defense Day in a quiet and simple manner due to the crisis the country is going through. But we must not forget that the armed forces are at the very heart of the rescue and relief effort through out the country, from Swat in KP to Thatta in Sindh. They are reaching the remotest of areas to get people stranded in flood water to safety and offer food, medical aid and other relief to them. Unfortunately, the masses in Pakistan have not remained as enthusiastic about the Pakistan Armed Forces due to a few incidents which occurred during the reign of President Pervez Musharraf, the former Chief of the Army Staff. But regardless of those incidents, which surely are not recalled as a pleasant memory by any Pakistani, we should not take the role of Pakistan Army and other Services for granted. Although, I cannot tell Pakistan Army what to do, since they know their job better than anyone, but I would like them to work a little to improve their rapport with the general public the way it was in the memory of 1965 War. For that, the Army need to take steps to repair the little damaged bits of its reputation. Many blame them for not letting democracy prevail in the country, as military dictators have ruled the country for over three decades in the country’s history. It is a bitter fact, but the Army need to work to improve this aspect of their image. The current Army Chief General Ashfaq Pervez Kiani is a very good example in this regard, who is offering his full support to the Democratically elected government of Pakistan in probably the most turbulent years in the history of Pakistan from 2008 to the date of the publishing of this post. While Pakistan is threatened with extremists and terrorists, and now, with the worst natural disaster hitting the country, Pakistan Army has been the central force at the heart of the fight. However, the Pakistan Army need to be careful while carrying out operations against terrorists that no civilians are harmed by them. Because if that happens, I will not blame any of the affected people either to lose respect for Pakistan or for Pakistan Army. The most important aspect to remember is that although the Army fights by force and arms, but the real victory is winning the hearts and minds of the people. Any patriotism and so-called actions for national interest must not take precedence over humanity. Many people also criticize Pakistan Army for taking up the most of the budget of Pakistan. It is true that defense takes up an overwhelming amount of the budget, but Pakistan is one of those scenarios of a strategy game, which is a tough assignment, and where you need to build a strong army as soon as possible to ensure your survival. I think the budget issues will remain the same in the future. However, Pakistan Army could take steps on their own for allowing as much to the public relief from their own budget as much as it is possible in this time of crisis. I am pretty much sure that they already would have been doing so. Having said that, still there is no reason why the Defense budget should not be reduced to make space for more important areas, such as education. Furthermore, the class divide for facilities need to be eradicated, mentioning without being specific. If you are a Pakistani and do not realize what they are doing for you, then consider this. They are making sure that you live your lives comfortably, with peace and without any threats. You would be correct in criticizing them for not being good enough to prevent the terrorist attacks, but it is not easy to do so for any army of the world and besides, they are actually engaging in active operations against terrorists, and have been acknowledged to be better at it than the NATO forces. At least, I am grateful to them. Thank you, Pakistan Army for keeping me alive. Apart from people fighting over how racist they are while discussing incidents of violence, sometimes words of sense appear on the pages of the Express Tribune as well. Oh, but then again, what I am talking about right now is not a work of a full-time professional columnist, so maybe that is why. However, let us come to the point. Pakistan right now seems to be passing through the darkest and worst of its phases ever since its creation in 1947. Pakistan is currently facing every possible problem which exists under the sun, let it be corrupt leadership, poor law and order, violence, lack of education and discipline, threat from terrorists, international pressures, a weak economy and even the worst natural disaster in recent history of the planet. A coincidence? Maybe not, because in Pakistan, it doesn’t rain, but it pours. Some basic problems lead to many others. A lot of people can get you depressed with their words, but maybe not Syed Ali Raza Abidi. His recent post in the Express Tribune Blogs titled “Solving Our Problems: Pakistan-ization“, which offers solutions for a change, instead of the same old rhetoric of hopelessness and the same old mantra of “the end is nigh”. This is the reason why I have decided to mention this meaningful and constructive post here and to add further to it. I also added a brief and impromptu comment on the blog page. A Secular Constitution, Education and Brave Leadership. Will solve many social problems. The goal must be Economic Freedom. One of the most meaningful posts that I have read on this site for a long time. Although some people may not agree with the first three words of my comments. So let me address those first of all. Although it is a popular notion that the struggle for Pakistan was initiated for the Muslim community of the India under the Raj, so that is why many people believe that Pakistan should have a constitution with Islamic provisions, but that does not mean that Pakistan should not consider a Secular constitution like most sensible countries. Incorporating Islamic provision is not really an issue, unless they result in the preference of a particular community as compared to the others, and even worse, may not offer enough, and ideally equal civil rights to some communities. It is useless to be too specific about it, but it is common sense if you look at it. Every citizen of Pakistan must have equal rights and the constitution should guarantee that. I don’t really understand why anyone should disagree. There should not really be a concept of a majority and minority community. I personally disapprove both these terms when it comes to communities. When every community and citizen has equal rights, why is one community a majority or a minority? What if the Sunni population is larger than that of the Shiites, and what if the Shiite population is larger than the Ahmedis? And the same applies to other religions like Hinduism, Sikhism and Zoroastrians. It does not matter because all are equal in importance. All are Pakistanis. Maybe it is not possible to completely prevent social discrimination of communities which do not have the majority of population in a particular area, and this applies to anywhere in the world, whether you take the example of India or the United States, but at least Pakistan should correct the text book. It is important to do so. I think the most important step that any government can take is to change the communal based status of the constitution. This will be an important achievement, unless some crazy right winger registers a petition in the Supreme Court to get the amended constitution reversed to its miserable communal state. It will be the most tragic thing that will happen to the country since the 2010 floods. Unfortunately, hardly anyone in Pakistan talks about it, and even the most progressive and secular parties of the countries assign no weight to it. Maybe they are afraid of the reaction of the people, who are under the false impression that Pakistan needs to have an Islamic constitution. There is no need to delete the Islamic provisions, if everyone agrees to that, but not if they are conflicting to the equality of civil rights. However, there is no need to paint a communal color to the constitution anyway, so that no community in the country should feel left out. Only Muslims can be the President and the Prime Minister of the country currently. Pakistan should be an equal opportunity employer. This was how the founder of Pakistan, Muhammad Ali Jinnah, a Twelver Shia by faith, but a Secular statesman in political vision, wanted the country to be like. Yes, he believed that the country should offer the freedom to Muslims to practice their faith, which they have, but he also wanted other communities to have equal rights in every way. They may have their freedom in the country, but we have to offer them their equal civil rights yet. The Ahmedis often complain of discrimination, and with a secular constitution, their complaints will be answered on a basic level at least. It is up to the Muslims to decide about their status as Muslims or Non-Muslims, but as far as ensuring equal civil rights are concerned, that is the responsibility of the secular government. I think we must not be emotional or sentimental in this regard, and must treat the matter pragmatically. This could solve a number of social problems in Pakistan and could prove the first step towards the education of the masses, which will further result in the eradication of communal prejudice, violence and sectarianism. Mr. Abidi talks about a solution in his post that as a nation we need to speak and face the truth. This is one truth which we have been avoiding for a very long time. While these points could never have been put in a better way, I only added a brave, honest and straightforward leadership to it, which should have a clear intention to work towards the progress of the country, unlike the passive establishment and the morally corrupt political leadership of the country. The bureaucracy, feudals and politicians of the country have been infested with corruption, which has become an integral part of the society, from the grass root level to the ruling elite. And yes, the armed forces should be as accountable as any other Pakistani institution, because they ensure the existence of the country. The people of Pakistan already realize the importance of an independent judiciary. But an important point was raised in the post under discussion that we must recognize the enemy within our ranks. It is the enemy within which is pinning the country down. As for the pseudo-intellectuals he talks about, well let’s just say that people find it fashionable to speak against their motherland. There can be no second opinion about the attention which the health sector requires. But education by far remains the most important element of the post. Unless the people are educated, do not expect any progress or improvement of any kind. This means that the education facilities should reach every single village from Gilgit-Baltistan to Gwadar. Not only will this produce an economically self-sufficient society, but will also purge out the disease of acceptance of violence and prejudices in the society. A sincere and honest government can make that happen. We have all the funds we need. Once everyone is educated, and in a uniform system without abolishing the Madrassah system, there will be no more incidents like the Sialkot murder. Many in the West blame Islam for all the violence, but do not realize that actually the cause is lack of education. Why the educated Muslims around the world are not resorting to such violence? I know it is easy to rant about it, but the right intention is all what is needed for offering a solution to the problems of the country. If you want to sum up the post under discussion, it can be done in just two words: “right intentions”. Moreover, Pakistan must work towards financial independence, no matter how difficult and hard it seems. This is the only way the country can break free from the shackles holding it down. This will also offer more diplomatic freedom to the country and greater influence among the nations of the world. As for the pressures from the world powers in various areas, this is where the role of brave leadership comes into play. Leaders like Jinnah and Zulfikar Ali Bhutto have done that. It can be done again. Things have never been worse for Pakistan. It is the perfect time to change. Facing the right way is needed to be done. When you’re even afraid to take the first step.